This movie is everything what people want from a martial arts movie. It contains incredible stunts sometimes with wire works. It has Kung Fu magic. It's full of ninja trickery and there is a lot of comedy. 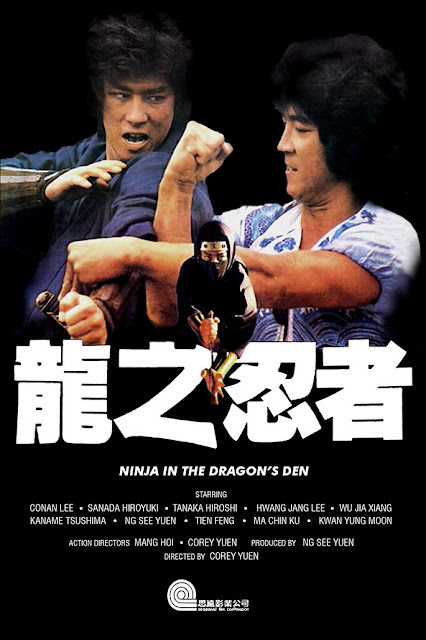 Ninja in the Dragon's Den therefore is without a doubt one of the best martial movies ever made in history. Still it is very difficult to get a hold of a decent or affordable copy on DVD or Blu ray in the original language. I have watched the film dubbed in English and German. And you know what despite that handicap I was not bothered by this at all. Since the action alone is superb. I know I already said it but let me state it again that the martial arts is more than excellent in this film. A young Conan Lee and Hiroyuki Sanada (The last samurai, The promise) show their magnificent skills whenever they can. Both of them bring to the screen what the fans want. Do I really need to tell you that the story does not matter that much? The introduction of this movie reminded me of several other movies about ninja's made in the Eighties! You know the ones where each ninja show what they are capable of. But something about it is off like it is meant as a parody of (or tribute to) the other ninja movies made around that time. Or maybe I am looking too much into it and I got distracted by the use of the theme music. Perhaps it was just a way to capitalize on the popularity of the Ninja films. Whatever they were going for compared to those cut and paste Godfrey Ho ninja films Ninja in the Dragon's Den is far superior. But how can it not be since director Corey Yuen made sure the action and the stunts were top notch. So do check this one out if you have never done before. It's a martial arts classic that deserves your attention.